I am always looking for ways to reinforce letter and phonetic learning. Especially with Margaret since my tried and true ways of teaching her to read have failed. She is a very visual and hands-on learner and I often run out of ways to "show" her the material she needs to master. I was so excited when Fundanoodle offered me one of their products for free in exchange for a review on this blog. If you have or know a child under second grade you're going to want to check this company out. The products are high quality, educational, and fun. 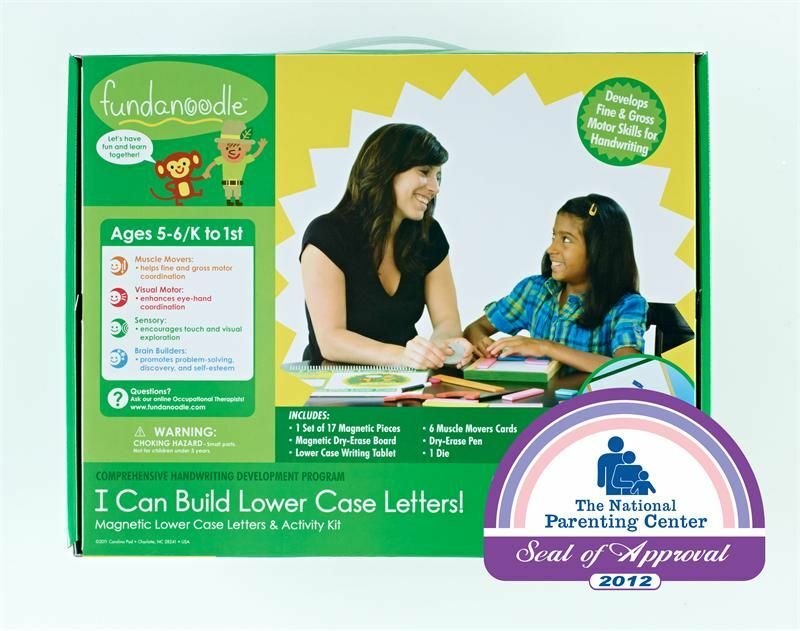 I received the I Can Build Lower Case Letter Kit!, designed for grades K to 1. It is designed to help children master identifying and writing the lower case letters through gross motor movement, practicing with magnetic letter pieces, practicing on a dry erase board, and finally, practicing in a writing tablet. Some studies suggest children need to repeat a skill 50 times before they master it, so all these different ways to do the same thing appealed to me. When I received the product I was really impressed with the quality of the items and the ease of use. It all came in a sturdy box designed to store and tote the items around. Items were separated into their own compartments and were ready to use. The box contained 17 magna stix (magnetic pieces in curves, slants, and straights), a large dry erase board and pen, six colorful muscle mover cards, large wooden die, and a lower case letter writing tablet. We used this product as a fun way to reinforce skills Margaret is learning in our current phonics program. We would begin by rolling the die and choosing a movement card. It was such fun to spend a few moments mooing like a cow or waddling like a penguin. Then Margaret would create the letter using the magnets. There is a guide right inside the box to show you which pieces to use for the letters in case you get stuck building them. After we built a letter or two Margaret would write the letter on the dry erase board and then on paper. The tablet pages are colorful and engaging. Since Margaret is not my youngest child, I had her use the pages as a reference only and use grid and lined paper to practice writing. Although intended for parents, this program was completely adaptable to my classroom setting at LMCA. The language arts class at LMCA has only four kids, and this was the perfect number for me to use the product. If you had more than that this would be perfect as a station or small group activity. I used it in a similar way with one student rolling the die and choosing the movement card. That student led the group in the movement and also got to make the letter out of magnetics on the board while the other students wrote it on personal write boards. Getting ready to roll for a movement. Since I brought the kit to LMCA the students have asked to do it again several more times. It is a big hit! WHAT DID MY IN-HOUSE PRODUCT TESTER THINK? I liked it so much I don't even know which part I liked more. The 'I Can Build Lower Case Letters!' kit is available on the Fundanoodle website for $29.99. Wow, I thought it would have been a lot more. What a deal! In addition to this kit, the company offers many products for early childhood learning including math kits, writing kits, and kits designed to improve fine motor skills through fun activities like cutting, pounding, or lacing. From what I saw on the website, everything is very reasonably priced. So great when such inviting materials are actually affordable. Other reviewers over at The Schoolhouse Review Crew got to look at many of the Fundanoodle products for their blogs. Click here to read those reviews, or click the banner below. What a lovely review, thank you! We're so glad you had great success using Fundanoodle at home and in the classroom. We love seeing the kits used in both settings and glad you had the opportunity to try it with your students. We also love that Margaret enjoyed it so much!